Salley, South Carolina (March 4, 2012) – After getting off to a relatively slow start with a fourth place finish at the series opener in January, Cory Buttrick came on strong to win this weekend’s Sandlapper National Enduro in Salley, South Carolina, round three of the AMA/Rekluse National Enduro Series. The FMF/KTM rider was solid and fast in all six tests – turning the fastest time in two tests and never finishing outside of the top three in the other four – to take the overall win by 42 seconds over Fly/RidePG/WP Racing USA/Leatt/KTM rider Steward Baylor. The win was Buttrick’s first since late 2010, and it elevated him to second in the series standings behind Baylor. Second went to Baylor, who came on strong in the final test to eclipse eight-time champ Michael Lafferty for the runner-up position. Baylor made several mistakes in the early going, including a couple of falls, leaving the South Carolina rider in a hole he couldn’t dig his way out of. Despite the poor start, Baylor still leads the series standings by 12 points with seven rounds to go having won the opening two rounds of the series. Lafferty rounded out the podium, and the factory Husaberg rider was in position to finish second had he not “thrown it away” in the final test. Defending champ Russell Bobbitt, who won this event handily in 2011, finished fourth on his FMF/KTM but continues to struggle finding his form after spending the winter recovering from a wrist injury. GNCC regular Kailub Russell got off to a quick start, finishing third in the opening test, however the FMF/KTM rider struggled with the tightness of the course and settled in to fifth at the finish. Thad DuVall was another fast starter, and the Team Shenandoah Honda/Offroad Champions rider looked strong while posting the second fastest time in the first test. However, a problem in the fourth test relegated the West Virginia rider to sixth at the finish. 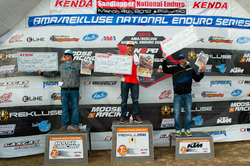 AM Pro Yamaha’s Jordan Ashburn edged Obermeyer Yamaha/Raines Riding Academy/Offroadviking.com’s Brad Bakken for seventh, while KTM-mounted Jesse Groem and Air Group Racing/Leo Vince’s Shane Hufford rounded out the top 10. Once again, the AMA/Rekluse National Enduro series enjoyed a record number of entries, nearly filling up the South Carolina event online in a matter of hours. The series now moves west for round four of the series, the Rad Dad Enduro, in West Point, Tennessee, on April 22nd. For more information go to www.nationalenduro.com.